Adirondack barn wedding, fall vistas, outdoor ceremony, birch arbor, rustic decor with burlap, oil lanterns and floating and votive candles. Designing and decorating the wedding of Kasie and Ross was a smooth operation. With her own definite ideas combined with her artistic talent, collaborating with Kasie was a joy! One meeting and several emails back and forth and we had ourselves a vision. As long as we were successful in producing “a bouquet exactly like this one!” (provided picture) we were going to be ok. On her wedding day, hearing Kasie say that her bouquet was “even more beautiful than she dreamed it would be” was music to our ears! 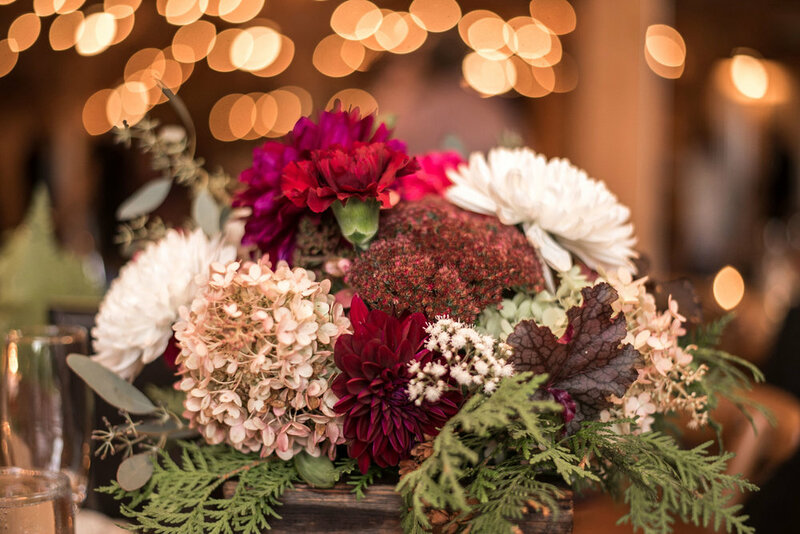 Perennia takes pride in using locally grown and picked flowers and foliage. Our crops of dahlias were especially abundant this year. Using our gardens and the gardens of our friend Ellen from Stonewall Farm, we were able to combine these rich, vibrant colors with glorious fall berries and foliage. 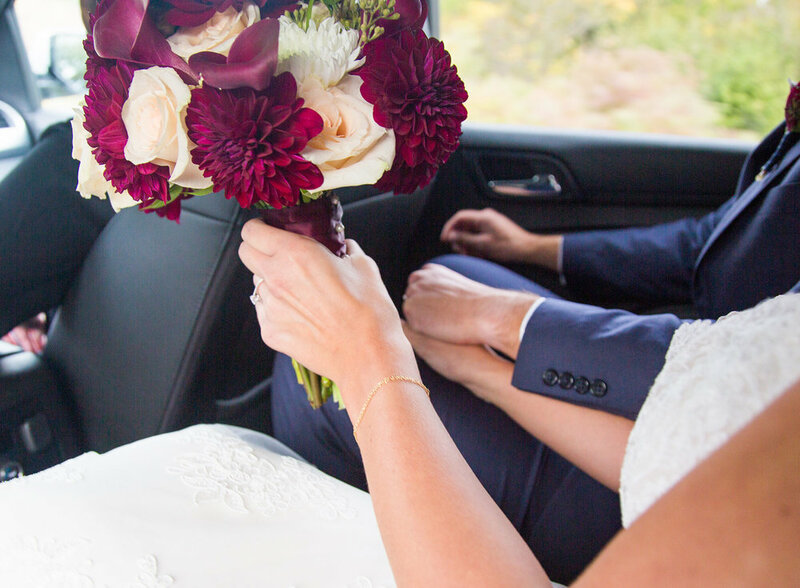 Bridal bouquets, boutonnieres, corsages and centerpieces all made use of these stunning combinations. As if predesigned, the gardens and grounds were planted with the same floral hues, making the total setting a true thing of beauty! Kasie asked for a simple birch arbor decorated with greens and white flowers. 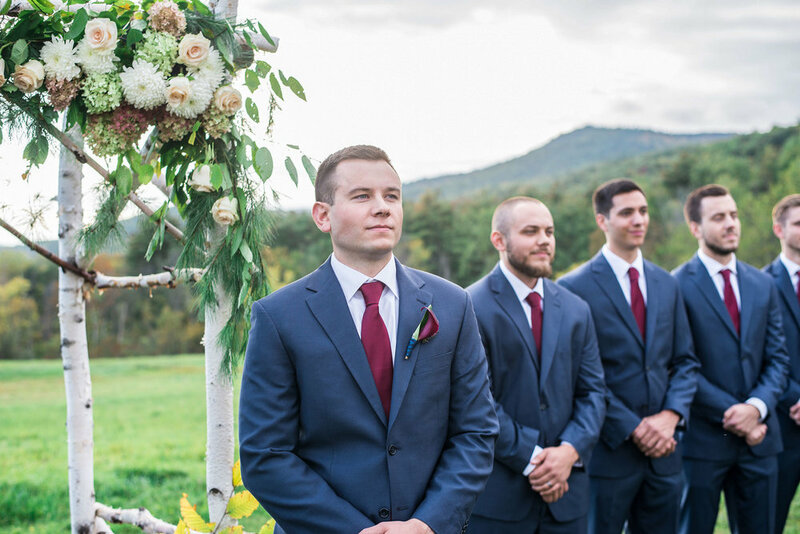 Rustic nail barrels filled with her beloved dahlias, beech leaves and greenery framed the ceremony site and allowed the glowing autumn mountain views to shine in the distance. After the ceremony the guests enjoyed cocktails on the stone patio and then moved into the barn for the dinner and dancing. The long farm tables looked gorgeous in the glow of a multitude of rustic oil lanterns and tiny votive candles. Flower-adorned lanterns hung above the head table along with delicately draped greens. 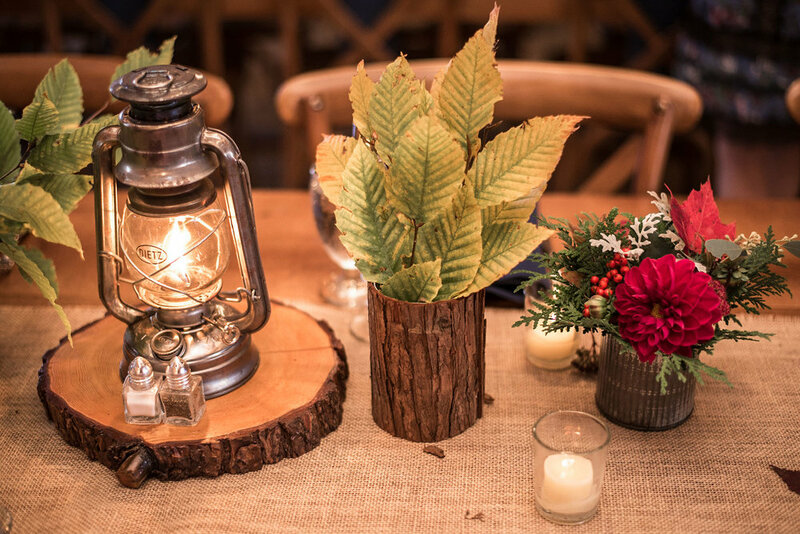 Antique, hand crafted boxes were filled with flowers and bark vases were arranged with greens and fall foliage. 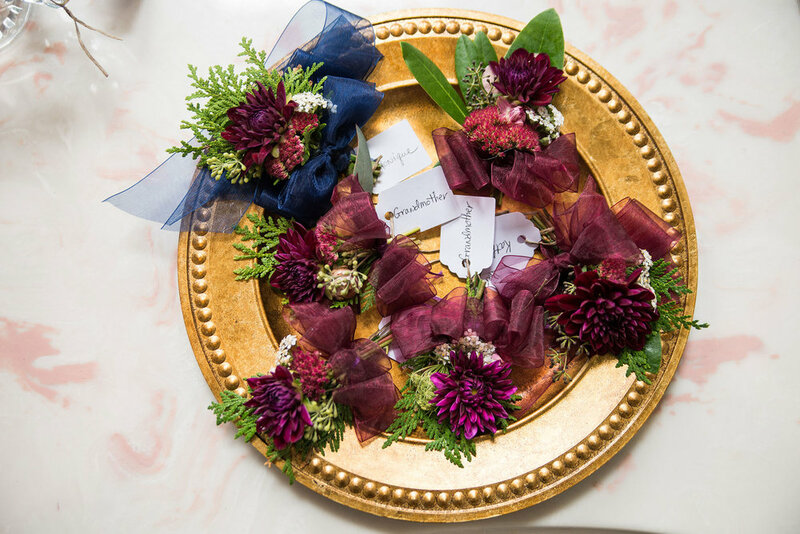 Kasie was instrumental in creating much of the non-floral decor. Clever table names were constructed with a framed picture of Kasey and Ross at the age each table number depicted. 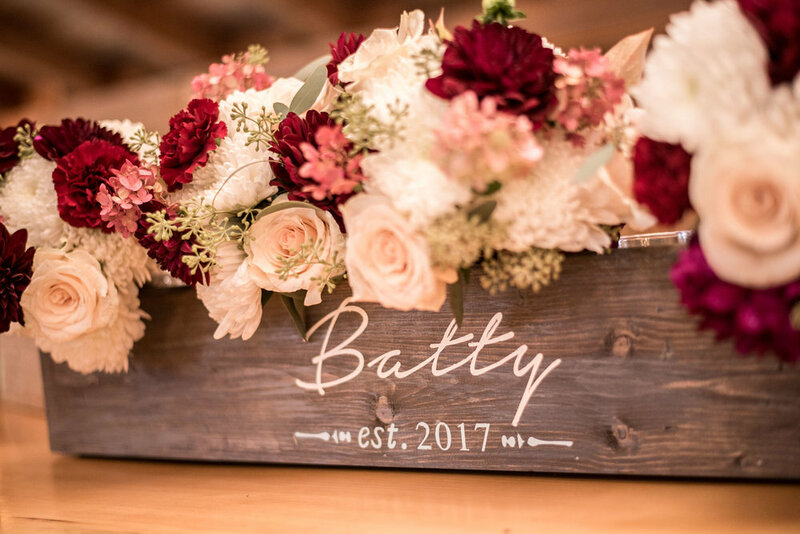 Multiple hand lettered signs and artfully designed displays were used for the guest book, seat assignments and even a large planter box for holding all the bouquets. All in all, the wedding was a day of joy and celebration. 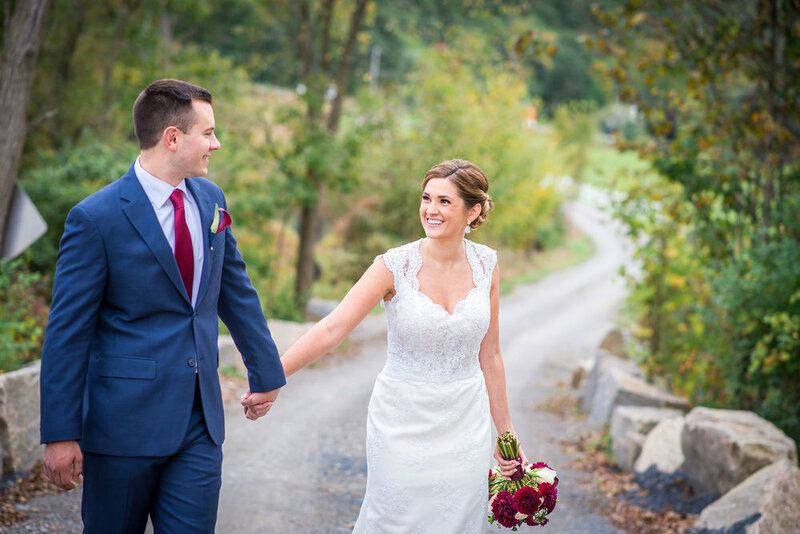 The bride and groom were surrounded by family, friends, food and festivities, on a glorious fall day in the amazing Adirondack Mountains!